Home » Health & Wellness » WEALTH UNTOLD? 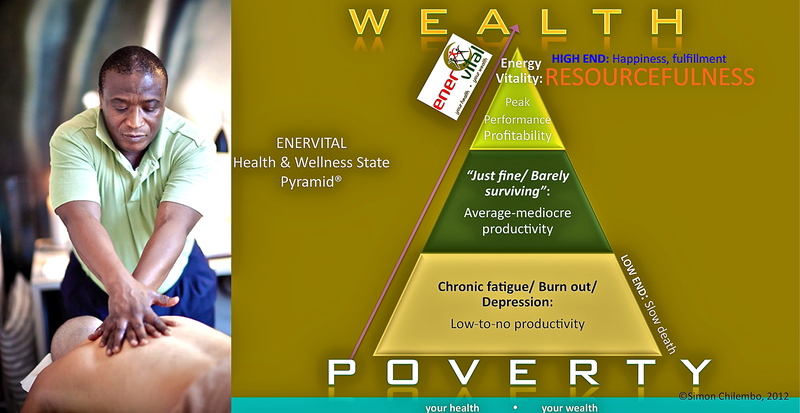 My goal at ENERVITAL is to help people attain their optimal state of health to enable them realize the most optimal wealth creation potential for both themselves as individuals, as well as their work/ business enterprises. In the perfect world my mind sees, healthy and wealthy people create and lead healthy and wealthy organizations and institutions. These form the basis for healthy and wealthy nations of abundance, where all have their basic needs and wants plus more are perpetually satisfied. On the grander scale of thought, health and wealth are means to world peace attainment. WEALTH: Sustainable long-term state of resourcefulness. – Resourcefulness: Boundless creative ability and innovative capacity. Resourceful people will always find solutions to challenges; and they will always find new and better, more efficient, and more effective ways of doing things. This translates to higher productivity, functional and rational use, as well as allocation of resources. When all is said and done, the rewards then are higher profits for business, higher returns on investment, and higher remunerations for the workers, as well as greater revenue generation for the state. And voilà, all live happily ever after! It goes without saying therefore that my ENERVITAL Healthy & Wealthy People® will be at the top of the food chain. Given their abundant creative and innovative energy, as well as capacity catalyzed by what I do at ENERVITAL, these people make things happen; they are not made by things, and are rewarded accordingly across the board. In (the) community many of these people are generous, considerate, and kind; they have strong philanthropic engagements in many parts of the world. If you also want to be healthy and wealthy, so you can have the necessary strength and endurance to help make this a better place for yourself and others to live to the fullest creative and innovative potential, come to ENERVITAL! My dream: Peace on earth. All are healthy and wealthy. Abundance is real, equitable. By Simon Chilembo in Health & Wellness on July 9, 2012 .